29 June 2012, 16 July 2012 and 20 July 2012. Translated by Suzanna Maria Emmanuel, guided by the Galactic Federation of Light Society. To find out its meaning, we need to go deep into the history of the Universe because the greater answers to all things are hidden in the secrets of the greater universe. CAEAYARON (KRYON) and HALISARIUS (One of the Great Galactic Federation of Light Society Leaders, and Pleiadian Chief Leader) teach us about the history. The castles depict power and rule. The Great Resistance, also called the great darkness since they have removed themselves from the Great Heart of the Great Divine Love, wanted to control all the universes. It believed it was powerful and strong. It took whatever it liked. One universe after another they destroyed with their greed and their power. They believed they were ‘gods,’ and wanted absolute immortality in their existence. The darkness set up its rulership in the universe, which is symbolized by the castles sitting in their own light and splendour as it believed it was more powerful than the Great Sovereign Love. It set up its own supreme ways shown by the light star above the centre castle, believing it was all powerful and that its ways were more powerful than the ways of love. The great battles in the universe were fought. The darkness wanted all to obey them. The love and light universes wanted to protect their universes. When they, the darkness, began to rule over other universes and took many as prisoners, those prisoners were not able to escape. They, the prisoners, became bound to their, being the darkness, ‘laws’ of being. On both sides of the castle it also shows its light as it believed it could lead other universes forward with its own leadership. It showed its power like two sharp swords of authority. Their sharp points were as deadly as a scorpion’s bite. Their swords show its challenge to the universe as if they were ready for a swordfight. Because so much destruction was caused in the universe, a solution needed to be created and hence our earth plane came into existence where all plays, within all the universes could play out. Divine Source wanted to restore the universe back to love and balance. An agreement was made to create this plane, our earth and when the people of the earth return to the love and the light, the darkness would need to surrender also and return to the great love. The darkness didn’t want that. No way did they want to listen to the Great Divine and come back into the Love. Their hatred for love is strong. Thus they wanted to keep the people on the earth away from love and the light. To do this they created great pain consciousness to keep the people on earth into suffering, away from the love within their hearts. 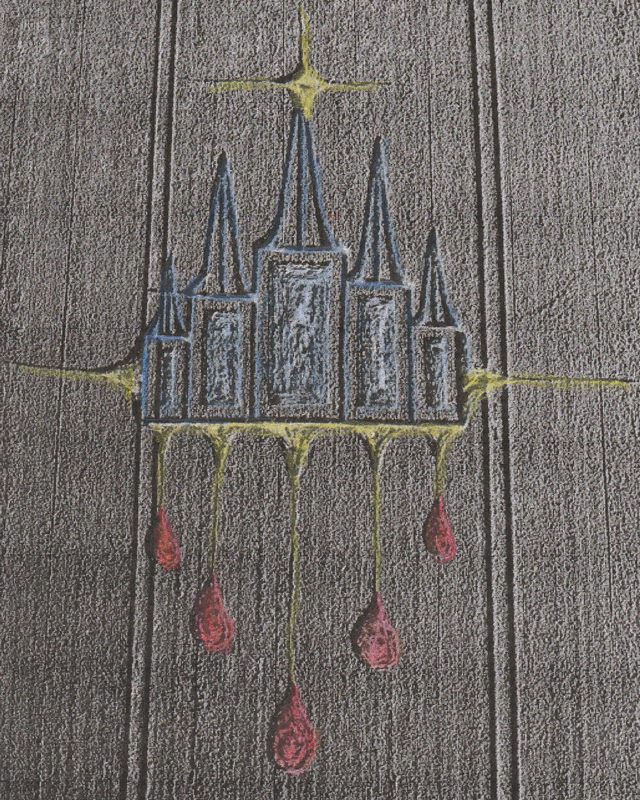 The drops underneath the castle depict the blood which was spilled in order to create pain upon our plane to keep people away from the love ways. The drops are on the lower levels of the castle showing us how they did this to keep us into the lower dimensions, for they know that they can only feed from our pain and anger and hold us down when we don’t awaken to the love within us. They established organizations to keep the people away from the love and the light. Power: which consists of religion (or spiritual beliefs not in the love), governments, banking systems, education systems, military, health systems, media, legal systems. Technology: which brings greater control over the people, greater war, sickness, food shortages and catastrophes to bring more pain and fear. Limitation: Brings sickness of the mind, body and spirit, brings fear, anger, loss of control, addiction habits, dependency on others, fear of ‘god,’ needing to listen to religious leaders, lack of love for self and others, incredible fear for future and pain of past, not being able to reach up higher to energies of love, ignorance, too afraid to go within, fear of exploration. Judgement: which brings religion, war, power, anger, fear, separation, desperation, confusion, depression and sense of loss. Knowledge: Which brings war, greed, power, limitation, anger, selfishness, religion, separation and great fear. Image two again shows the castle and it shows a whole other side. This is the side of what happened in the Supreme Divine Court systems when it was challenged. The Great Resistance (the red circle with its crown like shape above it) challenged the light systems. It believed it was more powerful than Divine Sovereign Love. It challenged the Great Divine Sovereignty of the Great Love Universe. The Great Resistance stated that the Great Love was weak and that they had the great power to bring the greatest evolution to all existence. It desired total control. The Great Divine Courts is seen above the star in the centre. It could not destroy the rebellious ones as they had conquered many universes already and if the challenge was not heard, the Divine Light knew that it would not end. It needed to end to resolve this issue so that peace and love would only exist so that Great Divine can bring greater expansion in the greater universes. Here in this image it shows how all things are fair and balanced in the greater universe shown by equal proportions. It also shows how they, the great resistance, brought everything down in dimensions with their heavy weight of lead like belief systems. You can see the castle ‘hanging’ down as if it was a pendant dangling down. A decision is made here, and it is showing the decision to us here in this image so that we can awaken to it. The circle now has expanded with large side spikes. They are like swords to accept the challenge. The spikes shows the decision to allowing rulership to be given for a little while on a special plane, the earth plane. On this plane creation would choose who they prefer to be with, Divine Love, or their rulership. The larger circle is now also showing its sword as if the challenge has been created in a sword fight and ready to challenge the darker beings. The sword upwards shows how all things need to rise upwards and how Divine wanted everything to align upwards, including all the dark beings who need to come to the love once again. Divine will never destroy energy. Everything, eventually, must be converted to the light. 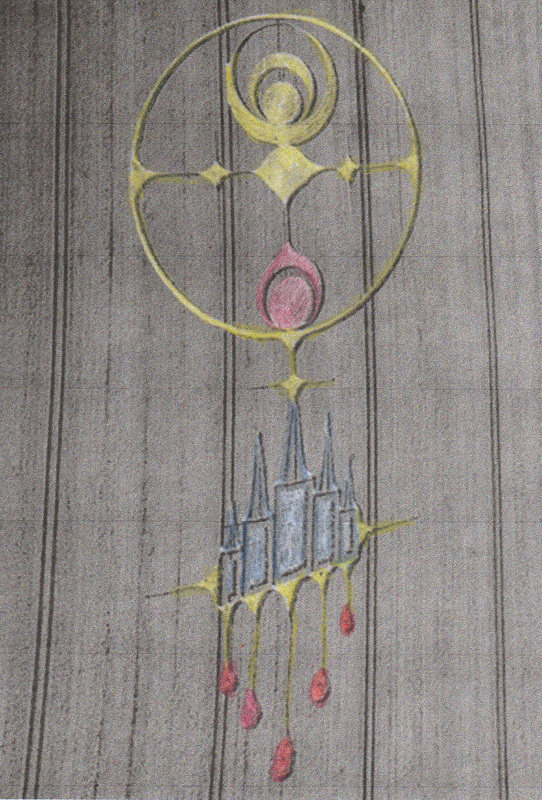 The Resistance was given a key, as shown here by the orange diamond at the bottom of the blood drops, to enable them to place all their rulership techniques upon the earth plane as it was given to the star beings to play upon. Hence the beings of darkness, the great resistance, were able to place all their thoughts into the grids of balance to play their own games to test whether people upon the earth would be strong enough to begin to awaken to the love or not. In comparison to the great strength of the Great Universal Love Universes, the castles don’t look very strong. Look at the size of it. Look at the size of its swords compared to the Universal Light swords. Nevertheless, once a challenge has been created, it must be resolved in accordance with Divine Cosmic Laws. * Blue/grey castle - showing cold of the darkness. Darkness being the great resistance. The Great Resistance separated themselves from the Heart of the Divine Love. It believed in its own power and rightful rule - hence the castles. * The light underneath the castle - showing how they believed in their own power and their own rule. * The star on top of the castle - showing how they believed they could rule the universe and were the rightful owners. * The five drops of red blood - shows their painful techniques to bring pain to our planet and also to other planets. They destroyed one planet after another in the greater universes. * The orange diamond below the red blood drops - shows that the Divine courts gave them a key to allow ruler ship to take place upon our earth. They could bring their pain thoughts into our plane. If we turned to the love and the light, they would need to surrender also. It also shows the heavy weight and how all dimensions dropped because of the great challenge. * The sword like spikes on the side of the castle depict the challenge they brought and the strength they believed they had. 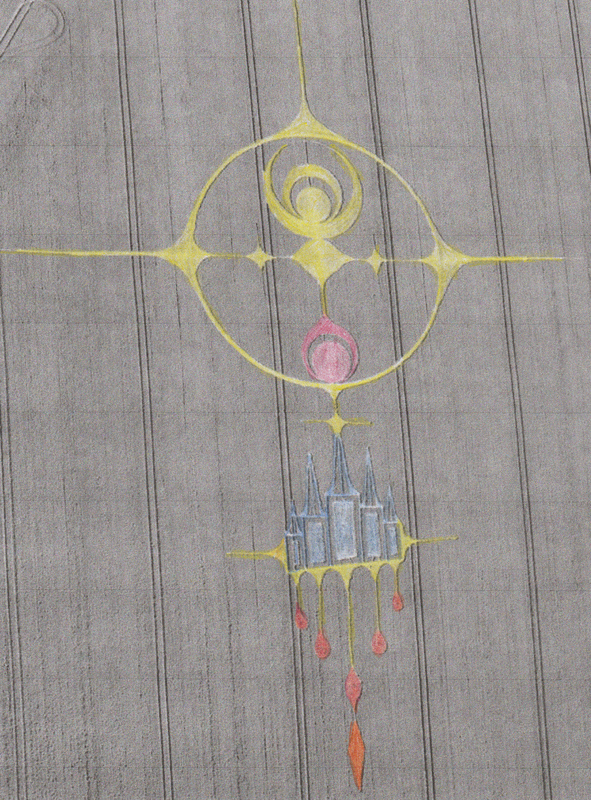 * The circle above the castle - show the Divine Court System. * The red shape - shows the resistance in front of the Divine Court bringing their case to the courts, believing that they could rule the universe. * The greater shape of light above the yellow star in the circle - shows the Divine Power. They listened to the great rebellious and created a plan to bring all things upwards by giving a plane to allow all plays to happen. * The line and stars in the middle of the star - represent Divine Unity and Strength together. It also shows fairness, equality and unity before any decision is made. * The spikes on the side show the sword like spikes of the greater universe, showing their strength and showing how they met the challenge of the great darkness.